Emma Lee Raines knows there's only one cure for a bad case of murder! I told you I was sick, reads the heastone abouve Mamie Sue Preston's grave. She was the richest woman in Sleepy Hollow, Kentucky, and also the biggest hypochondriac. Ironic, considering someone killed her-proprietor of the Eternal Slumber Funeral Home, know all this? Because Mamie Sue's ghost told her, that's how! And she's offering big bucks to find the perp. The catch is, Mamie Sue was buried by the Raines family's archrival, Burns Funeral Home. Would the Burneses stoop to framing Emma Lee's granny? With an enterprising maid, a penny-pinching pastor, and a slimy Lexington lawyer all making a killing off Mamie Sue's estate, Emma Lee needs a teammate-like her dreamboat boyfriend, Sheriff Jack Henry Ross. Because ith millions at stake, snooping around is definitely bad for Emma Lee's health. I've been cosistent with my love for Tonya Kappes' Ghostly Southern Mysteries. In case you're unfamiliar, it's a cozy mystery with a huge helping of supernatural shenanigans thanks to Emma Lee Raines' dead clients. A GHOSTLY MURDER was a bit tricky to solve. Mamie Sue Preston just wanted help with her teeth (read dentures) to cross over plus she died years ago from natural causes. Nobody suspected that she was murdered so Emma Lee had to dig deep to find clues that will point her in the right direction. 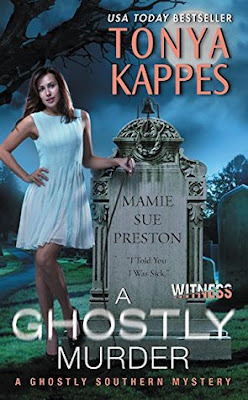 It also didn't help that ghosts are such unreliable witnesses to their own lives and deaths so Emma Lee's snooping landed her in a lot of sticky situations. Made the novel exciting and entertaining at every turn. I am also loving Tonya Kappes' slowly moving towards serial killer territory. Creepy notion considering Sleepy Hollow, KY is such a small town. On the personal front, Emma Lee Raines has grown a lot since the first book. I saw her as a beta character next to her sister, Charlotte Rae, and vivacious grandma, Zula Fae. Emma Lee sure found her own footing now and can stand toe to toe with anyone that crosses her path. She does it in such a clever manner though so people always end up underestimating her. I dare say she's fast becoming a mini-Zula Fae (it's both a compliment and a cause for concern). Lots of interesting developments that happened in A GHOSTLY MURDER in the romance department too, there's a potential in-law drama with Jack Henry's momma. Emma Lee won this round, I'm wondering though how meddlesome JH's mommy is going to be, and if Zula Fae is going to defend Emma Lee. Overall, A GHOSTLY MURDER is such a timely read for this time of the year. Ghosts, cozy murder mysteries, lots of Southern charm, humorous misadventures, perfect getaway that will have your belly aching from laughing a lot. You gotta try this series ASAP! It's been a while since I've done a Flash Book Friday. Thought I'd start incorporating them on my Friday posts when I do have one. And since Halloween is just around the corner. Let me share with you one of my favorite series when I was in High School: Fear Street: Cheerleaders by R. L. Stein. A little backstory, the series was introduced to me by a classmate. One book and I was hooked! I then devoured as many Fear Street books as I can and the Cheerleaders arc is my all time favorite. Save the cheerleader, save the world? Nope. Not at all. This cheerleader you want dead. Newcomers Corky and Bobbi Corcoran want more than anything to make the cheerleading squad at Shadyside High. But as soon as the Corcoran sisters are named to the team, terrible things happen to the cheerleaders. And it was creepy. Bad. Bloody. Graphic. Which is why I loved it! It was atmospheric, I imagined Fear Street to be this normal looking street, but somewhat shadowed or even cursed. The cheerleaders didn't help improve the street's infamy. Just thinking back about the books right now not only brings back excitable memories for me, it brings back goosebump-y feelings too. Now as I don't reread books, I'm wondering if I'll enjoy Fear Street: Cheerleaders as much as my teen self did, or will I find it corny and dated? The Kappes books are so much fun each time! I love to have a new book and to discover each new adventure! It's a great cozy, for sure! I've never heard of Tonya Kappes before, this series sounds interesting! I like that there's mystery in each book and the romance picked up in this one! Awesome review! I just recently read the first book and liked it but wasn't in love yet, so, I'm so excited to see that this fourth installment was such a good one! I think I just might go ahead and pick up book two now. It gets better. Also the series is very light, simple, and fun. So maybe just let yourself be entertained? I'm sure they will, but I think it's still a few books away. Gotta deal with Jack's mom first. Oof, that lady's a piece of work! This sounds like so much fun. I love having some comedy in my reads. It was unexpected too because the humor sure was distracting. I love that she injected a lot of "heart" in this series. You'll love the grandma too! Kappes sounds like an author I would love to add to my reading list, but I think I will pass on the cheerleaders. If you do reread them, I will be looking to see what you think of them now. No problem, thanks for stopping by Sherry! Happy weekend! OMG I love that headstone "I told you I was sick." That's too funny. This is a series I have been wanting to LISTEN to. It sounds like it would make good audio. :) I loved the chearleader Fear Street novels as a kid. Those were great! Oh gosh, I think the series will be awesome in audio! It's so darn funny! And happy to meet a fello Fear Street Cheerleader fan! Kappes is on my to-read list, I'm glad you liked it so much. Effectively, my Lowcountry mysteries are not as funny as this, perhaps, yet it's an awesome series anyway ! As to the horror stories, I refrain from reading them at the moment because I'm alone home at night and I'm a complete chicken ! It's nice to read a serious cozy too, gets the brain working. I'm a sissy too when it comes to horror stories. Unless I'm ready to have sleepless nights, I stay away from them! Hey Braine, great cover and thanks for the fab review. I love southern fried novels and wow if they've got that added paranormal its a win win! No problem, thanks for checking my review out. Enjoy the weekend! And that's the last time I picked up a Stine book, in high school. Everyone in school was hooked on them. 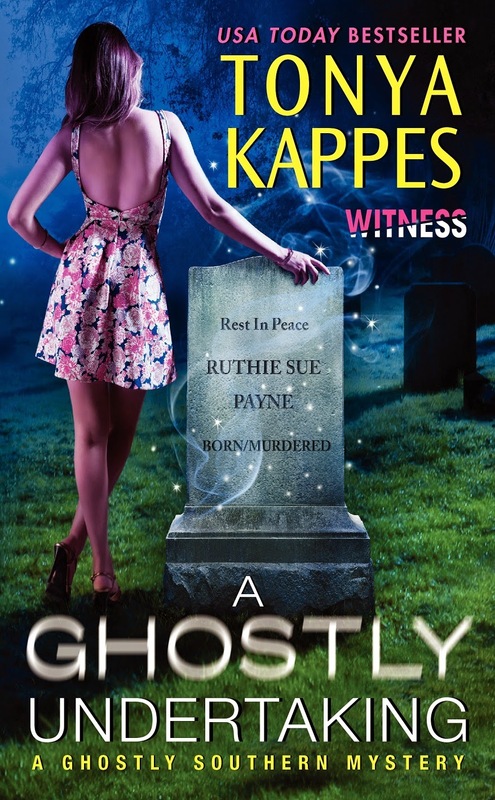 I have yet to try the Southern mystery series by Kappes. I bet I would love the Ghostly Southern Mysteries series. I'll need to try them soon. You can't go wrong with RL Stine. Great reads for this month! I hadn't heard of this before but I'm all for funny! I've been wondering about the Ghostly Murder series. I love the covers for them and they do sound perfect for Halloween reading. I like the combination of paranormal, humor, and romance. I will have to check these out. I just grabbed book one on Amazon...I think I need to try this series...thank Braine! I read the first book and have the second, but I havent had a chance to get to it. How did it already get to book four? Yikes. I am way behind. Can you believe I have never read Stine? He hit the scene after I was out of high school and in college so now I need to go back and see what the fuss was about. I've heard that these have a lot of good humor in them. I have all of them on my wishlist! Book 1 is on sale, grabby grabby! This series is on the radar. I like that the heroine is growing throughout the series and not all at once. The surrounding characters sound pretty hilarious, too. Kappes is STILL on my tbr pile. Gah you kill me with these reviews of it. Dude, I remember walking to the mall in 4th and 5th grade with friends and buying Fear Street books in good ol' B.Dalton's bookstore. These and The Saddle Club books. Those were the days. It's all I can read nowadays. Can't do anything too serious. I hadn't heard of this series before now but this book sounds really good. Love the cover, looks like fun. I like the idea of a cozy mystery with some paranormal elements, I haven't read any yet. Sounds like the ghosts add some extra difficulty to solving the mystery. And I like how you mention there are developments on the romance and personal front in this book, things like that keep sequels interesting as well. Great Review! You'd think they'll make things easier to solve. NOT! Cozy mysterious are never that great for me. But I totally started reading because of Fear Street: Cheerleaders!!! Hahaha. Thanks, you a fan too? OHhh yes I remember those Fear Street novels from high school hehehe! The ghostly, southern mystery sounds completely fitting for this time of the year! I totally missed those R.L. Stine books back when I was in high school. I only remember Goosebumps exploding in popularity when I was about to graduate college. I probably would have been too chicken to read any of them, even Goosebumps, lolol. I love the look of these covers! So fun! I'm not much into ghost books but I do love it when characters grow, so I'm tempted to pick it up just for that.